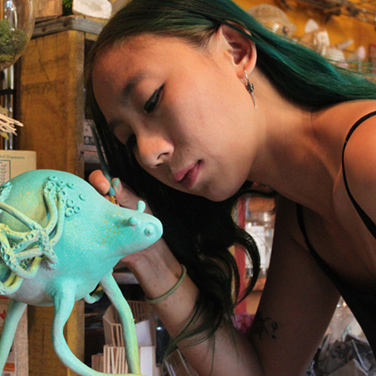 Trained as a theatrical scenic designer, Shing Yin Khor is now a sculptor and cartoonist obsessing over building tiny universes for her awkward, anxious creatures to exist in. She also writes at the intersection of autobiography, race, feminism, sexuality, privacy and too much thinking about comics. Her work has been exhibited across the United States, and acclaimed for its off-kilter charm and narrative. Born in Malacca, a port city of Malaysia -- and raised between cultures on a diet of fantasy tropes and post-colonial detritus -- she currently calls Los Angeles home.